Six points, a pair of Evan Rabon field goals, were the difference between Idaho’s determined effort to live up to its season motto to “raise the bar” in the face of a season’s worth of near-miss losses and the bitter knowledge that bar is not going to be crossed. After losing 13-7 to Coastal Carolina Saturday in its final home game, Idaho’s record is 3-7 with two games remaining. There is no chance to win the six games necessary to qualify for a bowl game. 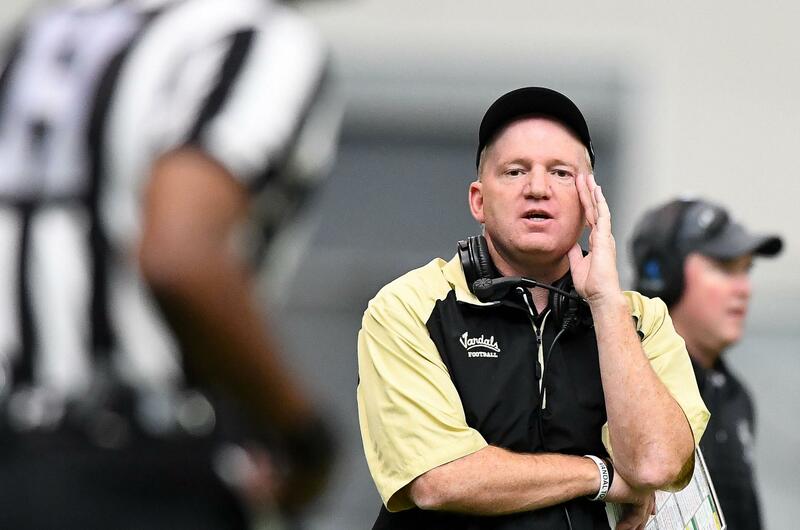 The Vandals were forced to go without four-year starting quarterback Matt Linehan. His senior season opened with him spending several days in Gritman Medical Center during fall camp, where he may have been treated for an infection. Senior Day saw him on the sidelines with a white wrap on his right hand that he injured late in the Vandals 24-21 loss to Troy. In between, he climbed Idaho’s career passing rolls to throw for the second-most yards all-time. In his place, the Vandals started sophomore Mason Petrino against Coastal Carolina. He completed 18 of 26 passes for 177 yards with a touchdown and an interception. But the inability to seize key opportunities that has dogged the Vandals so often this season affected Petrino, too. The critical play of the game may have occurred with 3:14 remaining. On fourth down and five at the Idaho 47-yard line, trailing by six points, the Vandals went for the first down. Success could have been a defining moment in their season and in Petrino’s career as a quarterback. However, he was sacked for a big loss back to the 32-yard line. Idaho was able to stop the Chanticleers, and the Vandals got the ball back once more at their own 25-yard line with 41 seconds to play. However, a clipping penalty backed up Idaho to the 17-yard line. From there, Petrino completed a nine-yard pass to Isaiah Saunders and followed with another nine-yard completion to David Ungerer. But time ran out before Idaho could run another play. Maybe the most frustrating missed opportunity occurred in the third quarter. Momentum briefly turned in the Vandals favor when linebacker Kaden Elliss drew a bead on Coastal Carolina quarterback Kilton Anderson at the Idaho 38-yard line. The play was blown dead and ruled a sack. But as the entire Idaho team turned its eyes to the video board on the east end of the Kibbie Dome officials reviewed the play and determined the ball was coming out before Anderson hit the ground. Ellis recovered the fumble at the Chanticleers 49 and ran. Had the original call been a fumble, Elliss would have easily scored as the entire Coastal Carolina team was behind him when he scooped up the loose ball. Idaho was unable to take advantage of the midfield recovery. After losing eight yards in four plays, the Vandals had to punt. The Chanticleers got an enormous break of their own early in the fourth quarter. They had driven from their own 39-yard line to the Idaho 17-yard line in 10 plays. From there, Anderson pitched to Marcus Outlow. The ball bounced off Outlow’s back, and Idaho recovered. But Anderson’s pitch had been forward. It was ruled an incomplete pass. Coastal Carolina kept possession and on its next play Rabon kicked a 34-yard field goal to take a 13-7 lead. The Chanticleers threatened again after they drove from their own 30-yard line to the Idaho 29-yard line. But Rabon’s 46-yard field goal try hit the left upright. The Vandals took the early lead. In the first quarter, Alfonso Onunwor, slanting toward the middle, gathered in a Petrino pass at the Chanticleers 18-yard line and carried it to the end zone. Petrino completed four of five passes on the drive for 54 yards, allaying concerns about Idaho’s ability to generate a passing game. Coastal Carolina put up 275 yards of offense, including 175 rushing, led by Alex James with 81 yards. Anderson threw for 100 yards, completing 11 of 23 passes. With no chance to play in a bowl, the Vandals will close the season with road games against New Mexico State and Georgia State playing for love of the game, according to Elliss. He tolled off the list of Idaho’s 17 seniors. Published: Nov. 18, 2017, 8:49 p.m. Updated: Nov. 18, 2017, 8:51 p.m.